All of Destroyer 2's effects can be seen on one page. 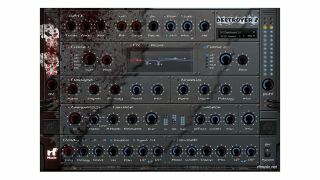 Another multi-effects solution has arrived in the shape of Destroyer 2, from rf Music. Offered as a Windows VST plugin, this features 14 effect modules. These include dynamic, distortion, time-based, filter and modulation effects, while you also get sample- and bit-rate reduction processors, stereo controls and a cabinet simulation. The signal routing algorithm is said to be flexible, and the interface comprises just a single page. There are three banks of presets, and 150 of them in total. Destroyer 2 is available now from the rf Music website. It costs $45, and you can also download a demo.